Awnings were invented primarily to shade out the sun, but let’s face it: Even in California, the sun doesn’t shine all the time. Depending on where you live in the Golden State, your home may experience significant bouts of rain, snow, sleet, and wind. That’s why you’ll want a high-quality, custom-manufactured, retractable awning from Sunesta for your home. 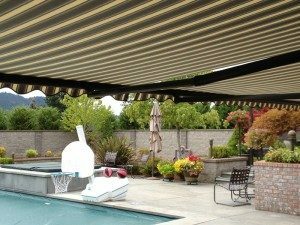 As a pioneer in the custom retractable awning industry, Sunesta is well aware of all the reasons you might want to extend and retract the awnings that not only provide shade on demand but also enhance your California home with stylish looks. Most of the time, you’ll want to extend your awning to expand your enjoyable outdoor living space by shading your patio or pool deck during the hot part of the day. You may also rely on awnings to block the sun’s rays from entering your home through window panes, where solar radiation can lead to faded upholstery on your favorite plush chair and run up your energy bills by making your air conditioner work harder to keep your home comfortable. On the other hand, you may decide to retract your awnings to enjoy cool breezes or starry night skies, or you may retract them during the wintertime so that the sun’s warmth is permitted to penetrate your glass panes and help ward off the seasonal chill. Our 100 percent solution-dyed synthetic fabric allows water to wick off and resists fading and mildew. Our frames are made from sturdy, durable metal that is powder-coated to resist scratching and rust. Our retractable patio awnings have been tested by T√úV (Technical Surveillance Association) for reliability and safety, and they meet other guidelines for wind resistance. In addition, you have the option of purchasing the Sunboot, a durable cover that’s available in a wide variety of fabric styles that protects your retracted awning during bad weather. For information about awnings or any of our awning accessories for your home in California, contact Sunesta today.